Warren Buffett - the man who has literally bet it all on Keynesian theory (who in late 2017 speculated that the Dow could be on its way to 1 million) - is unwinding a huge put option position in equity indices that he wrote during the worst of the financial crisis in 2008, about a decade ago. According to Bloomberg, the puts that he wrote have netted Berkshire Hathaway $2.4 billion in profit over the course of the last decade. But hey, when you know you have the Federal Reserve on your side to bail you and the entire global economic system out, why wouldn’t you write several billion dollars in equity index puts? Equity-index put options written by Berkshire Hathaway Inc. started expiring in June, and the last of them will be gone by January 2026. Buffett, Berkshire’s chairman and chief executive officer, initiated the deals between 2004 and 2008 to bet that stock prices would rise in the long run. 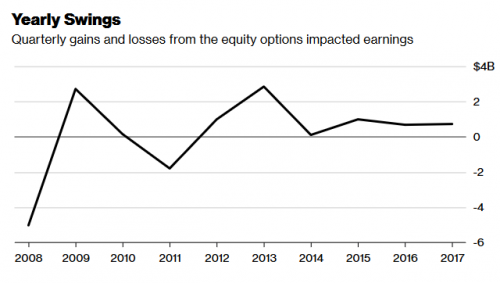 The options, tied to four major equity indexes, added a total of $2.4 billion to earnings from 2008 to 2017. As the positions are starting to inch closer to their expiration date, Bloomberg took a look at how they have benefited Buffett and Berkshire Hathaway over the years. The chart below shows their contribution to Berkshire's profit over the last 10 years. Buffett, who had been critical of the use of derivatives in the past (do as I say, not as I do) actually has argued that these transactions were different because - we are not making this up - there was no counterparty risk. Buffett, 87, already ended some other derivative bets, exiting his last credit-default agreement in 2016. His use of derivatives was sometimes controversial because he’d once lambasted them as “financial weapons of mass destruction,” later arguing that his bets were different and had no counterparty risk. I guess when your counterparty is the Fed, this could actually be true. 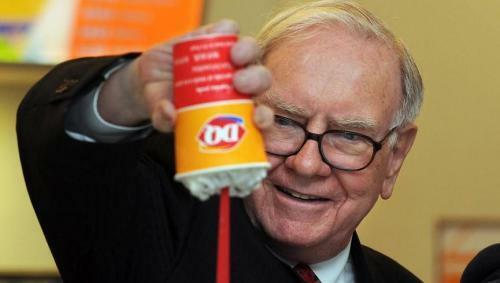 Buffett has likened the benefits of derivative wagers to the perks of his insurance operations. Berkshire received a total of $4.2 billion in premiums upfront on the options that it has put to work for more than 10 years, just as the “float” generated by insurance premiums can be invested before any claims must be paid. The derivative bets have created volatility in quarterly earnings, swings that Buffett said “neither cheer nor bother” him and his business partner, Charles Munger. Berkshire’s vice chairman, Munger defended the derivatives after a shareholder at the 2009 annual meeting questioned the deals. “There’s some limit to the amount of those things we should do, but I think we stayed well short of the limit,” Munger said. This is an adept analogy. Of course, unless a disaster strikes and you have to pay out. Terms on the equity options have shifted over the years. In a 2010 filing, Berkshire said it received $4.8 billion in premiums for 47 contracts. In late 2010, the company unwound eight of those options at the urging of a counterparty, according to Buffett’s annual letter to shareholders. That left Buffett’s company with 39 contracts and $4.2 billion in premiums. On some of the deals, the parties also have shortened maturities and reduced strike prices, according to Berkshire’s 2009 letter. The parties on the other end of the deal have remained a bit of a mystery. Buffett said in 2010 that Goldman Sachs Group Inc. was among the counterparties, without naming others. It’s unclear whether Goldman is part of the remaining group. A spokesman declined to comment. We can't think of anything less creative than betting on the "Don't Pass" line for the 5,000th time in a row and just hoping the house can win one more time. But why wouldn’t he? Having lived through the last 87 years where we have watched central banks do anything and everything possible to ensure that the stock market always rises, Buffett probably thought he was betting on the closest thing to free money possible while the entire global financial system was inches from ruins in 2008. How long Buffett's "strategy" will continue to work remains to be seen. 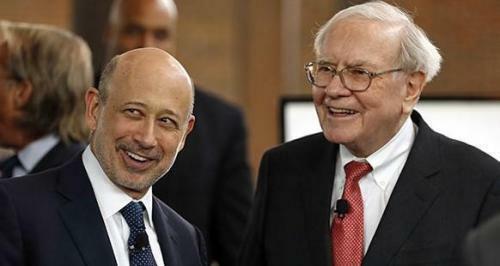 The idea of simply assuming the market is always going to go up will eventually have to give at some point – but for now, he is counting another major win where Berkshire Hathaway reaped billions as a result of nonsensical monetary policy and artificially manipulated interest rates. Congrats, Warren!